Pidgey in game: 11,371 Who? Important notice! Pokemon Pidgey is a fictional character of humans. Pidgey (Japanese: ??? Poppo) is a dual-type Normal/Flying Pokémon. Pidgey has an extremely sharp sense of direction and homing instincts. It can locate its nest even when far removed from familiar surroundings. It is a docile Pokémon, and generally prefers to flee from its enemies rather than fight them. By flapping its wings rapidly, it can whip up dust clouds and create whirlwinds to protect itself and flush out potential prey. Gust and Feather Dance are its former signature moves. Pidgey is very common throughout its range and can often be seen in meadows and forests. Wilbur, guardian of Pudgy Pidgey Isle, helped to teach a Pidgey named Orville how to fly in Fly Me to the Moon. Nearly all the other Pidgey on the island were too large for flight. Pidgey first appeared in Pokémon - I Choose You!. Ash tried capturing it, but failed because Pikachu would not obey him. A flock of Pidgey appeared in Pallet Party Panic where they were attacked by a flock of Spearow and a Fearow. The flock reappeared in a flashback in Fighting Flyer with Fire. Casey has a Pidgey, seen in her first appearance, The Double Trouble Header. Many Pidgey were featured in Carrying On! as mail-Pidgey, owned by Malachi and his grandfather. One of them was named Ken. Professor Oak captured a Pidgey just before Will the Real Oak Please Stand Up?. He used it to blast off Team Rocket. Pidgey are frequently seen in the background of many episodes flying in packs of ten or more. Sometimes, they may appear in town centers or fields nearby to Ash and friends, and usually fly away because of any local disturbance. Their appearances range from seemingly any anime episode, notably, Crossing Paths and Pokémon Ranger and the Kidnapped Riolu! Part One, as well as movies. A Pidgey figure is stored inside Ash's Voltorb clock as seen in Pokémon! I Choose You!, and pops out when the alarm went off and the clock opened. Pidgey appeared in a fantasy in The School of Hard Knocks and Dig Those Diglett! and in a picture in Pokémon Paparazzi. 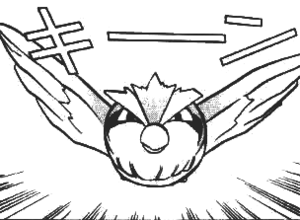 A Pidgey appeared in Electric Shock Showdown under the ownership of an unnamed Trainer. A Pidgey was seen in a Pokémon Center in Sparks Fly for Magnemite. Multiple Pidgey were among the Pokémon seen at Professor Oak's Laboratory in Showdown at the Po-ké Corral. Mandi used multiple Pidgey to perform magic tricks before his battle in Round One - Begin!. Multiple pink Pidgey resided on the Pinkan Island in In the Pink. Ralph and Emily were both shown in a flashback to have once owned a Pidgey each in Wherefore Art Thou, Pokémon?. A Pidgey felt asleep after Jigglypuff sang in Tunnel Vision. Trixie has multiple Pidgey which are used in her circus in Love, Totodile Style. A flock of Pidgey appeared in The Apple Corp!, where they were shocked by the gang of Pichu after trying to steal apples from an orchard. In The Poké Spokesman, Simon claimed to have met a Pidgey, an Oddish and a Rattata, which could talk, as seen in a flashback. A flock of Pidgey appeared in the wild in The Legend of Thunder!. Two Pidgey were among the Pokémon seen in a forest outside the Ice Path in EP250. Several Pidgey were among the inhabitants of the Dragon Holy Land in Fangs for Nothin'. In Pokémon Heroes: Latios & Latias, two Pidgey can be seen having a wash in a drinking basin. Flocks of them were also populous throughout Alto Mare. Three Pidgey were among the Pokémon that were having trouble with the Haunter from the area they lived in. Pikachu and Meowth managed to drive the Haunter away. 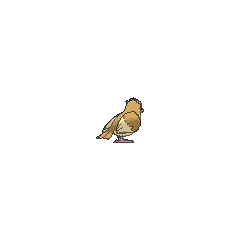 A Pidgey was used by one of the students of the Pokémon Trainer's School in Gonna Rule The School!. Multiple Pidgey appeared in Lucario and the Mystery of Mew. Also, one appeared in the opening of the movie. A Pidgey appeared in The Saffron Con as a Pokémon owned by a Coordinator that was taken by Team Rocket. A Pidgey also appeared in One Big Happiny Family! in Jessie's fantasy. A Pidgey appeared in Coming Full-Festival Circle!. Multiple Pidgey appeared in Best Wishes Until We Meet Again! Multiple Pidgey appeared in Kalos, Where Dreams and Adventures Begin! A Pidgey appeared in Lumiose City Pursuit!, A Jolting Switcheroo! and Awakening the Sleeping Giant. Multiple Pidgey appeared in A Shockingly Cheeky Friendship! Two Pidgey appeared in a flashback/fantasy in The Forest Champion!. A Pidgey appeared in an image/neon in Showcase, Debut!. A Pidgey appeared in a video in Performing with Fiery Charm!, under the ownership of a Pokémon Performer. Three Pidgey made a brief appearance in A Frolicking Find in the Flowers! where they were scared by Ash's Talonflame. A Pidgey appeared in SM003, as a silhouette. A Pidgey appeared in Ecruteak City in The Reawakening. Pidgey makes a couple of cameos in the Red, Green & Blue chapter; in Bulbasaur, Come Home! as one of the Pokémon that escapes from Professor Oak's Laboratory. In ...But Fearow Itself! when a frozen one is pictured by Bill in his explanation about how to stop a Flying Pokémon. The Safari Zone's tour guides are automated robotic Pidgey, called Pidgebot in Long Live the Nidokin. In Pidgeotto Pick-Me-Up, two Pidgey along with a Pidgeotto kidnaps Yellow's Caterpie. Cyrstal captured a Pidgey on her way to Professor Elm's Lab in Three Cheers for Chikorita. A Pidgey appeared in Querulous Qwilfish, aiding the construction of the Battle Tower. Another Pidgey appeared in The Last Battle XIII as one of the Pokémon sent to help the fight in Ilex Forest. In Pocket Monsters Zensho, a flock of Pidgey swarm Satoshi at the beginning. He is later saved by Professor Oak's Charmander who later becomes his own. 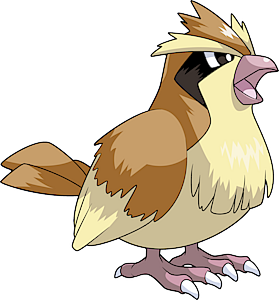 Gold's first capture on his journey was a Pidgey which later evolved into a Pidgeotto. Pidgey shares its category with Spearow and Natu. They are all known as the Tiny Bird Pokémon, though Natu has also been called a Little Bird Pokémon. Pidgey and Spearow are the first Normal/Flying bird-like Pokémon, along with their evolutions. This is repeated in later generations with Hoothoot's, Taillow's, Starly's, and Pidove's evolutions and with Fletchling; the latter is the only Normal/Flying bird-like Pokémon in its family—its evolutions are Fire/Flying. Anatomically, Pidgey resembles a Cedar waxwing or sparrow more than it does a pigeon. However, there have been some references to Pidgey Mail, alluding to homing pigeons. 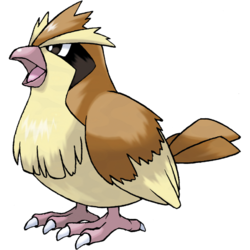 Its category, "tiny bird," added to the sound of the end of its name, could suggest that Pidgey is also based on a chickadee. However, it and its evolutions seem to have more traits related to ospreys than pigeons or chickadees. Pidgey could be a corruption of pigeon or a combination of that with the word budgie (a type of bird), chickadee (a type of bird), or pudgy (referring to its plump physique). Poppo appears to be the onomatopoeia of the sound a pigeon makes: ????? poppoppo.